The all-in-one package combines tested solar PV components with a cutting edge 7kW LG Chem battery storage to provide the customer with optimum solar generation and consumption. Firstly, in order to maintain progression with the rest of the customer’s project, GreenGen installed a 3.98kW solar array. Considering pitch and orientation, GreenGen calculates the system will generate 4060 kilowatt-hours of electricity each year. As a result, and due to GreenGen’s MCS accreditation, this solar array is set to earn the customer annual payments of £270 from the Feed-in Tariff. Interested in solar PV? Further information on solar can be found here. 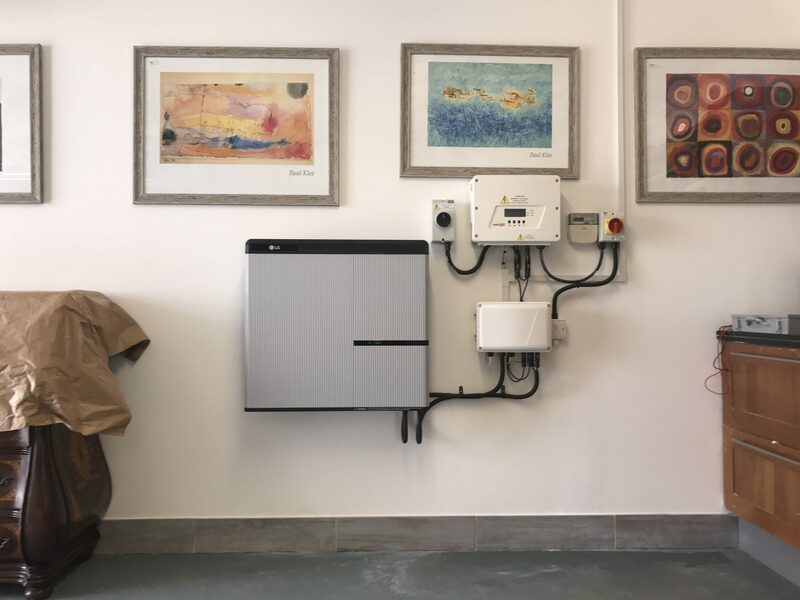 In order to increase their self-consumption and further reduce running costs, the customer opted to install a 7kW LG Chem Battery Storage system. Adding battery storage to a solar PV system allows the user to store unused solar generation in their battery, reducing export and maximising benefit. This energy then discharges to replace grid demand throughout the evening. The result? Further, significant savings on their energy bills. GreenGenUK estimates this 7kW LG Chem battery installation will allow the customer to use 95% of their solar generation. Additional information can be found on our Battery Storage page. This LG Chem solar battery installation features the SolarEdge S4 interface – one of the first in the UK to feature this cutting edge technology. As such, SolarEdge is using this installation as a test site for the new interface. The StorEdge S4 interface connects the battery to the SolarEdge inverter. To read more about StorEdge, visit SolarEdge’s website. Firstly, replacing grid demand with solar energy and storage reduces the home’s energy bills will by £620 a year. Combined with Feed-in Tariff payments, the customer will see a total annual benefit of £890. Secondly, replacing supply from harmful fossil fuel sources with clean solar power means this system will eradicate 1.75 tonnes of carbon each year.